Our small staff allows us to be responsive and flexible to meet all of your income tax preparation needs. We focus our full attention on finding the best solution for your tax situation. Your tax return will be filed promptly and with accuracy to ensure you receive the maximum refund. Rest assured your information is secure, safe and private. We do not sell or share your information. 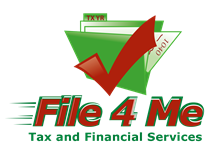 At File 4 Me, our mission is to educate, equip and empower you with information that will help you legally lower your personal tax burden. As a tax payer, it is important for you to understand how the tax code impacts how much you pay in taxes. Tax preparation is not about dropping the right numbers in the right boxes, it’s about planning throughout the year. Knowing how legislative changes can work in your favor, will help you save money and maximize your income tax refund. No matter how many receipts you have gathered on April 15th, it won’t matter if you didn’t know you should have established a flexible spending account for $2500 during open enrollment in October of last year or you didn’t know you could defer that $1500 bonus into your 401K to help lower your taxable income. By the time April 15thcomes around there’s nothing you or your tax preparer can do. Our high service quality and satisfied clients are the result of our commitment to excellence. Click here to read more.